[re]design curates exciting design exhibitions that educate visitors about sustainability in an inclusive and accessible way. We can work on a bespoke project to your brief and budget, or rent you a ready-made exhibition. The following shows are ready to go and available to hire. 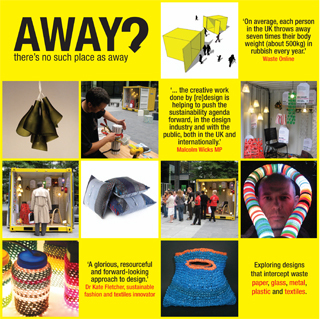 If you are interested in hosting a [re]design exhibition or collaborating on a project please get in touch. Away unearths positive design solutions that tackle the large volume of domestic waste that is discarded without consideration. Its creative exhibits explore lifecycles and object-user relationships of commonly used materials. 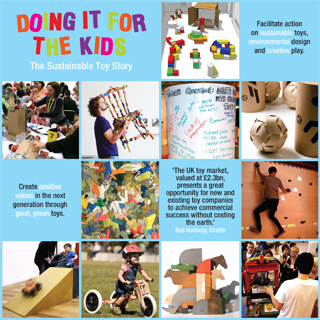 Doing it For the Kids: the sustainable toy story is a toy design exhibition that demonstrates good design, positive play values, green materials, eco packaging and lifecycle consideration. To find out more about the exhibition and what we can offer please download the Doing It For The Kids PDF. LIGHTEN UP looks beyond the bulb and into the bright future of sustainably enlightened lighting. From powering lights with old phone chargers to using materials such as seaweed and pasta, LIGHTEN UP captivates everyone. 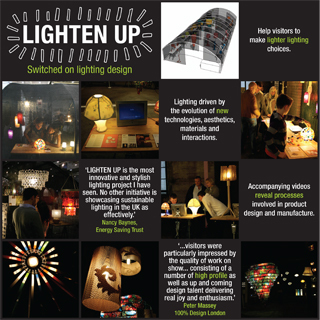 To find out more about the exhibition and what we can offer please download the Lighten Up PDF. Are you sitting comfortably? and sustainably? 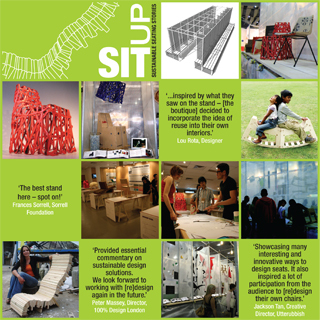 SIT UP: Sustainable Seating Stories gets to the bottom of sixteen ‘good’ and gorgeous seats from UK designers with a passion for sustainability. To find out more about the exhibition and what we can offer please download the Sit Up PDF.